I previously posted about some longwearing makeup items that I used at a recent conference. A couple other items I discovered were some more Revlon products. I was curious about lip stains. I wanted something that would last the majority of the day without having to touch up constantly. I am lazy and hate having to touch up my makeup LOL. So I was at my local drug store, Shoppers Drug Mart, and they were having a sale on some Revlon products, buy one item and get the other ½ price. Since I have a hard time passing at deals, I bought Just Bitten in Forbidden ($12 CDN reg price) and Colorburst Lipgloss in Rosegold ($4.50 CDN sale). 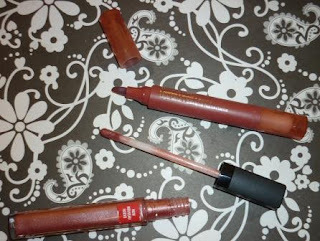 The Just Bitten lip stain looks like a marker. Basically it is a marker pen sans the smell. One end is the stain and the other is a clear lip balm. It looked pretty cool. The plastic tube it comes in is the supposedly the same colour that is in the marker. This how I chose the colour I wanted as there were no testers to try. So the first time I put it on, I used the tip of the pen. The colour came off way too dark. It was way darker that what the packaging indicated and you could see the pen strokes! My friend and I were laughing and a bit appalled how dark it was and how small it made my lips look. So the next time I put it on I used the side of the marker tip and swiped the colour on. The colour came off much lighter and truer to the shade it was supposed to be. TIP: apply using the sides of the marker tip; you will get a lighter application and no ‘marker’ streaks. Be cautious when applying to the outer rim of lips and make sure your lips are not dried out - lip stains are not forgiving of mistakes or dry patches! ﻿﻿﻿I am not sure how long Revlon claims that this colour will last but I noticed it did last for about 5-6 hours. It does fade as time goes by. I mostly tested this out at work and at night during the recent conference I was at. I had lots of coffee/water and of course ate during this period. The colour stayed put and the lipstain did not transfer at all (lipgloss was another story LOL). I did have to reapply my lipgloss periodically but I wasn’t as bothered by that as I still had colour on my lips. I’d give the Just Bitten pen a 4 out of 5 now that I figured out how to apply it LOL! On to the Colorburst Lipgloss; I adore this stuff! I would liken this lipgloss to a creamy lipstick. It is thick and shiny but not heavy or in your face goopy and shiny. Plus it is very moisturizing; it has vitamin E in it. I also like the sponge tip applicator. The colour Rosegold is perfect for me. 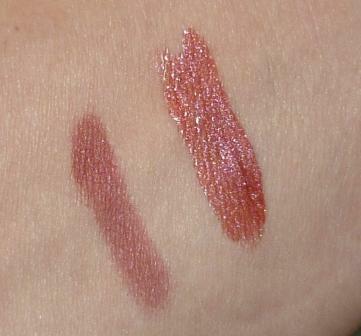 Since it is my current favourite I use it with the Just Bitten lipstain instead of the lip balm. Like most lipglosses it did transfer onto my coffee cup but oh well I love the colour to much to care HAHA! I love those lipglosses!!! I have 4 currently...I think...I lose track all the time, but I definitely have Rose Gold! I love the formula. I just recently got the lipstain as well b/c my CVS had it for 75% off, so i'm trying it out. Not sure how I feel about it yet. What colour did you get in the lipstain?